The Neutrogena Deep Clean Ultra Foam Cleanser comes in two variants: Revitalizing Pink Grapefruit and Brightening Mulberry. You must be wondering how someone overly gaga about brightening and whitening chooses to prioritize testing out the revitalizing variant over the illuminating one. Let me tell you that ever since I turned 30, I'm more for products that promote cell renewal! 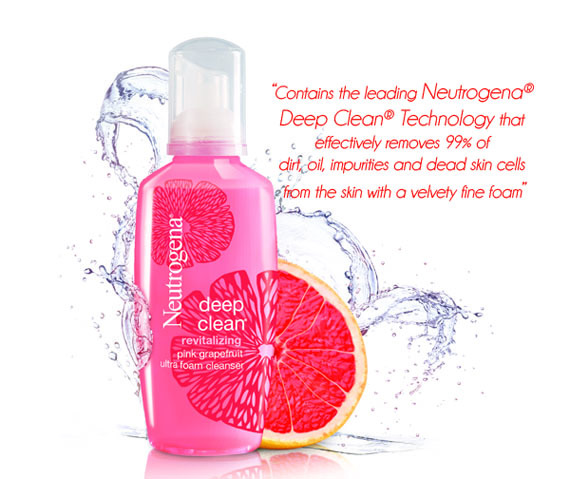 Developed with dermatologists, the innovative new formula contains the leading Neutrogena® Deep Clean® Technology that effectively removes 99% of dirt, oil, impurities and dead skin cells from the skin with a velvety fine foam, as well as Anti-Oxidant Pink Grapefruit Extracts that helps stimulate healthy cell renewal. Unless one has a super techie device to objectively quantify a clean face, the best way to evaluate a cleanser's efficiency is to observe the amount of gunk a cotton ball shows us after toning. I often use an antiseptic, Clindamycin, after cleansing and the Neutrogena Revitalizing Pink Grapefruit Ultra Foam cleanser passes the "cotton ball test". I never had to worry about any evidence of extreme dirt residue during the time I used this. And if you'd like to know what I think about the cleanser in the least objective way, my face feels clean and looks brighter after I use it! This product works well for those who use light face makeup or none at all. Since I am acne-prone, even if I wear sheer powder, I always tandem the Neutrogena Ultra Foam cleanser with a good cleansing oil or a cream makeup remover. The product introduces grapefruit extracts into the foaming facial wash to stimulate healthy cell renewal. I almost literally died when I learned about it since it was what my stressed out skin severely needs. However, I started breaking out from the cleanser in less than a week. I gave it another week to be tried out but the pimples are just making my skin, in its already bad state, far more horrible-looking. And so I had to stop. I knew I had to give the Neutrogena Revitalizing Pink Grapefruit Ultra Foam Cleanser the eX approval. We were over. I gave the bottle to a good friend who has a normal skintype and was experiencing occasional bouts of stubborn whiteheads (which she never experienced before). And what do you know--- she loved the cleanser and is using it religiously to date. 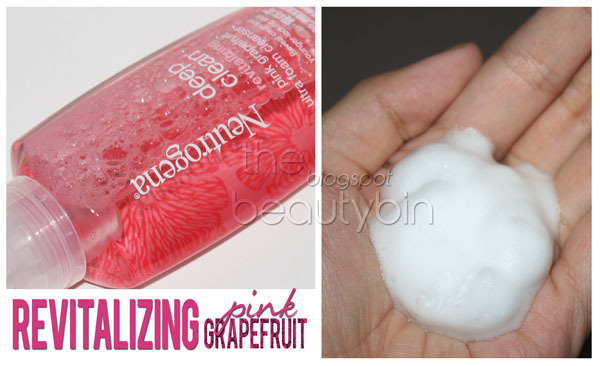 I would have loved to experience a more permanent revitalized face from the Neutrogena Deep Clean Revitalizing Pink Grapefruit Ultra Foam Cleanser if only I did not break out from it. I am still unsure why I harbored tiny grape-like zits on my face but I'm hoping it's not from the grapefruit extracts! Disclaimer: This is not a paid post. Product was sent to me for review purposes. Post content is in accordance with my personal experience while using the Neutrogena Deep Clean Revitalizing Pink Grapefruit Ultra Foam Cleanser. This is a good basic cleanser for me. Pero yun nga, pag may makeup, di keri. thanks for telling me that it causes breakout!! We have tried Neurogena already and it really effective. Everyone can try it too.